Makita Rp0900 Plunge Router features triple depth presetting for adjusting plunge depth. Buy this plunge router from Souq.com.The Makita Plunge Router is sure to cater to all your needs. With a 900W powerful motor, this plunge router provides incredible performance. For precise working in several steps, this plunge router features triple depth presetting for adjusting plunge depth. All the more, the oversized ball bearing construction ensures a long-lasting life for tools. Moreover, for improved control, this plunge router features rubberized handles. Buy this plunge router from Souq.com. This plunge router features in an incredible design that ensures for an easy cutter change. The 27000RPM provides the user more control that prevents mishap and offers smooth operation. 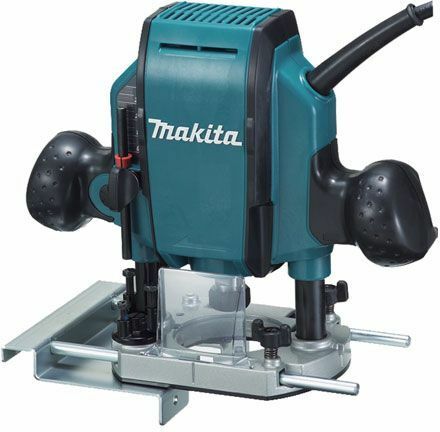 This Makita plunge router boasts an oversized ball bearing construction that ensures long-lasting life. This router features a chip deflector that is engineered to direct chips away from the operator. This prevents your clothes from dusty wooden chips.